Well-crafted multiple choice questions are like a clean window. If the question is articulated clearly and concisely, it allows you to see what the student does and doesn’t know. These fixed choice questions, which also includes checkboxes and true/false options, require students to identify the correct answers from a set of possible options. The longstanding debate as to whether multiple choice questions or free-text questions are better for testing student understanding will always be under scrutiny, as in this post by Pluto. While both types of questions have their pros and cons, both are also valuable assets in your teaching toolbox. Daniel, a teacher from Bath, tells us that he finds both types of questions to be essential to his teaching process. I use multiple choice questions as formative ‘hinge questions’ during my lessons to give me a broader idea of how the class as a whole understands the material and see if we’re ready to move onto the next step. I also use them to test knowledge of concrete facts. On the other hand, I use free-text questions when I want to get a deeper understanding of how the students work through a problem. The advantage of multiple choice questions is that they can easily be scored, providing quick feedback and allowing you to efficiently and unbiasedly assess a large number of students over broad content. Analyzing general trends in multiple choice answers can also provide you with valuable information on where students are getting confused or can spark a discussion for them to defend why a different or multiple answers could possibly be correct. Here, we’ve outlined the essential steps for creating stronger fixed choice questions so you can gain as much value from student answers as possible. 1. Write the stem first. Your questions should present a single problem related to significant content from the lesson. As the University of Texas’s Faculty Innovation Center suggests, you want most of the information to come in the question so the answer options can be short and you should avoid using negatives when possible as they tend to confuse most readers. 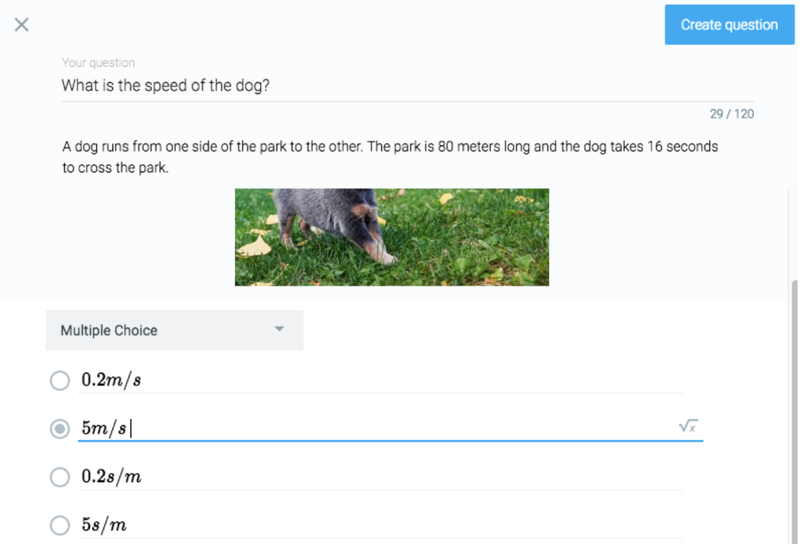 If you’re teaching a physics class and you’ve been learning how to measure the speed of objects in motion, you can use this process to create clear questions that test your students application of the formula. For example, you could set the problem up with a real-life situation and then clearly ask for them to find the speed using what they’ve learned from the lesson. 2. Identify and write the correct answer. Make it brief and clear. Don’t make the correct answer obvious in relation to the incorrect answers and make sure you switch up the placement of the correct answer (e.g. don’t always make the correct option the third option). In the example from above, the answer would be found by filling out the equation (distance/time = speed), or 80 meters/16 seconds = 5 m/s. 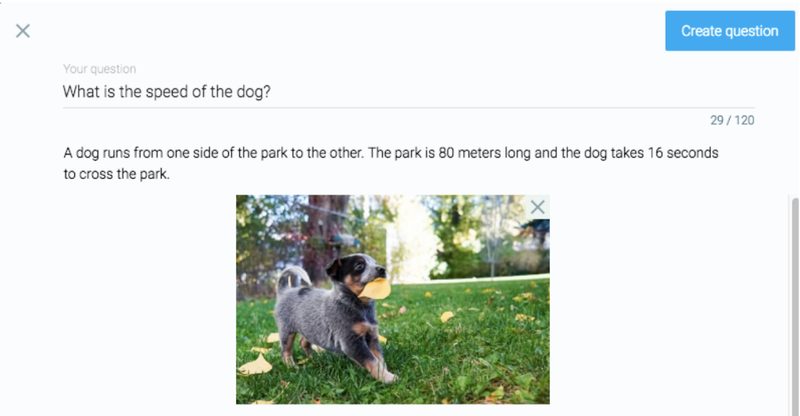 Quick Tip: Using Classtime, you can add variety to your lessons and switch between Multiple Choice, True/False, Checkboxes, Free Text answers, Categorizer, and Sorting while motivating and engaging students to learn. 3. Now write the incorrect answers, or the distractors. Common student errors make good, plausible distractors. It’s generally best to avoid obvious incorrect answers and try not to use ‘All of the above’ or ‘None of the above’. This can tend to make the student more nervous and think you’re trying to trick them. Plausible distractors for the previous speed example could be found by plugging the numbers in the wrong place in the formula or simply changing an important factor of the answer. E.g. 16/80 = 0.2 s/m, .2 m/s, 5 s/m. Quick Tip: You can create high-quality displays of mathematics notations in your Classtime questions by using the popular markup language LaTeX. Remember, it’s your goal to create an environment for all students to learn and engage in and you should create a toolbox of your own techniques that help you reach this goal. All types of questions are meant to engage and continuously teach your students, so assess what information you’re trying to get before deciding on the type of question to ask and make sure you set enough time aside to create good questions. What other steps do you take to create great multiple choice questions? Sign up for our newsletter on the right to get teaching tips delivered to your inbox.